Paul Krugman was born in Long Island, NY in 1953, and attended, as he puts it, "one of the many John F. Kennedy High Schools". His love of science fiction -- especially Asimov's Foundation -- inspired him to focus his studies on both history and economics. He received his Ph.D from MIT in 1977, and went on to teach at Yale, Stanford and MIT. In 1982, Krugman spent a year working for the White House Council of Economic Advisers, and in 1991 the American Economic Association honored him with the John Bates Clark Medal. He is currently a professor of economics at Princeton University. Krugman is the author of fifteen books, including The Great Unraveling, Peddling Prosperity, and Fuzzy Math: The Essential Guide to the Bush Tax Plan. He is also the author of several hundred articles, and is currently a regular columnist for the New York Times. An "unabashed liberal", (according to Newsweek), he was allegedly passed over for a spot as chairman of Clinton's Council of Economic Advisors because of his outspokenness. In 1999, Krugman was paid $37,500 by Enron to serve on an "advisory panel that had no function that I was aware of" (Krugman's words.) When writing about Enron he disclosed the fact that he served on the panel, but neglected to disclose the payment until much later. 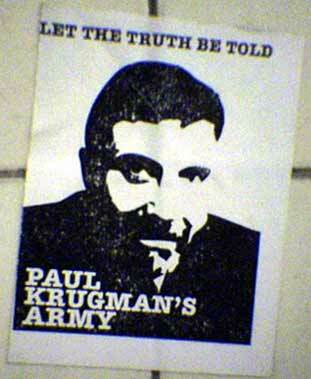 Some have used this fact to disparage Krugman's character, but that charge is dubious. Since 2000 he has been writing for the New York Times, where he often skewered Bush administration economic policy, and to a lesser extent he criticizes the Obama administration's errors. His criticisms gained new clout when he was awarded the 2008 Nobel Prize in Economics, interrupting several weeks of headlines reporting a world-wide economic collapse that Krugman had warned was coming.